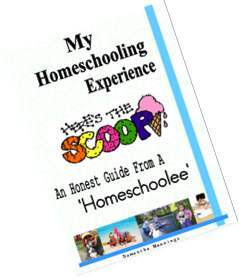 This homeschooling ebook gives some insight into the pros and cons of homeschooling. There are many great advantages to homeschooling your kids. Our daughter goes into some of them in her book.As a homeschool family we believe that homeschooling benefits each child in a unique way. Find out more in this printable book. Thousands of different options lay before you when it comes to home school and thousands of different books and such give you advice on which options to choose. But where does this advice come from? A lot of the time it is based on stats and statistics. We believe that our childrens education and welfare should have more thought put into it than what should work. We know that every child is different and homeschooling isnt all about academic success. So, to help you make the right homeschooling decisions for you and your family I, having been homeschooled myself for several years, have written an ebook about my experience. I talk about issues that I know are important to parents thinking about homeschooling or parents committed to homeschooling but have concerns. Reasons for homeschool Why do parents carers decide to home school? I discuss this in this chapter and share why our parents decided to home school us. Leaving school Worried about the effect leaving school will have on your kids. Here I will share how I felt and offer essential advice for you to help your kids through this tough time. Teaching styles Thinking about how you want to teach your kids? Here are some things to consider about what your kids are thinking when it comes to being taught. Rewarding and punishing in home school Reward? Punish? Both?How? In this chapter I discuss different methods and share what methods we used. Returning to school Worried about returning your kids to school or unsure of how they will cope? Here I discus, honestly, what it was like for me and offer the best advice when it comes to supporting your kids through this transition. Pros and Cons of homeschooling Not sure you want to home school your kids? Worried about the effect it may have on them? Here I discuss the advantages and disadvantages of home schooling. The purpose of this ebook is NOT to tell you what to do but instead to give you an insight into what your kids think about the whole home school experience. This is to create an understanding in you about what your kids are going through and what they may think about different aspects of home school. I then give my advice based on what would have improved my experience. This may help you to support your kids more effectively. There were some practical things that I did found hard when I first returned to school. For example, I didnt like to talk to the teachers because I wasnt comfortable with talking to teachers in such a formal manner, addressing them with sir etc. This was something I had to simply get used to as I got more comfortable with being in school. The main reason I mention this is that I didnt want to ask my teachers for help when I needed it.This can be dangerous as, like it was for me, it can mean that children are not getting the support they need when they need it most. I also was unsure of doing small tasks on my own. Not work wise, but practical tasks such as picking things up from places and borrowing chairs from other classrooms. This was driven by a fear of not being sure what to do if I got lost or if I did something wrong and I think this feeling was shared by a lot of the other children. Middle school is scary to begin, regardless of whether you have been home schooled. I found it difficult when everyone began asking, what elementaryschool did you go to?. This was because I didnt want to say that I hadnt gone to elementary school but did home schooling. I thought that other kids would think I was weird and different because of all the misconceptions around about home schooling. Boy was I wrong! Many of the kids who I told thought it was really cool that I had home schooled and accepted it with open arms. Once we have recieved your payment, you will recieve our e-book. It will arrive through email so it is essential you fill in your email when prompted after you click buy it now. Please triple check your email address! This book has been written to provide information to help you on your homeschooling journey. Every effort has been made to make this book as complete and accurate as possible. However, there may be mistakes in typography or content. Also, this book contains information on homeschooling only up to the publishing date. Therefore, this report should be used as a guide not as an ultimate source for making homeschooling decisions. The purpose of this book is to educate. The author and publisher does not warrant that the information contained in this book is fully complete and shall not be responsible for any errors or omissions.The author and publisher shall have neither liability norresponsibility to any person or entity with respect to any loss or damage caused or alleged to be caused directly or indirectly by this book. By clicking Buy now, you have read and accepted our disclaimer.